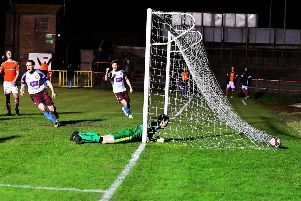 Blair Adams had a birthday to remember as his first career hat-trick helped South Shields to a thumping FA Cup victory over Garforth Town on Saturday. Shields won 5-1 at Mariners Park as Adams stole the headlines on the day David Foley made his second debut for the club. David Foley on his second debut for Shields. Adams scored three goals in just six minutes either side of half-time to ease the Mariners’ passage into the second qualifying round, with Gavin Cogdon and Matty Pattison also on target. Joint managers Lee Picton and Graham Fenton made no changes to the Shields team which started Tuesday’s 1-0 win at Stalybridge Celtic, with new signing Foley named among the substitutes. The hosts produced free-flowing football for much of the match and were dominant in all areas. They went close in the fifth minute when a swinging free-kick from the left by Josh Gillies bounced in a dangerous area and just evaded a touch from Jon Shaw. Shields were getting plenty of joy in the early stages, particularly down the left. Garforth fought gallantly to keep the game goalless and were indebted to goalkeeper Toby Wells in the 13th minute when he brilliantly kicked away a 10-yard effort by Gillies after good work by Pattison and Adams for Shields. Wells produced another good save to keep out a shot from the edge of the area by Pattison, and parried another effort from the South African soon after. The ball rebounded to Cogdon, who danced round Wells before firing an effort which was brilliantly cleared off the line by the head of defender Aodhan Brownlee. The pressure was building and Shields were playing some terrific football, but Wells would not be beaten. Gillies let fly from 25 yards and the ball was destined to find the roof of the net before Wells pushed it over. Cogdon headed a decent chance wide after good play by Gillies on the inside-right of the box as Shields continued to show patience in their pursuit of a breakthrough. It finally arrived with 34 minutes on the clock when Gillies found a way through with a defence-splitting pass and Cogdon made a reverse run before firing low past Wells, finding the corner. That was the cue for the floodgates to open. Gillies went agonsingly close to doubling the Mariners’ advantage when his effort from the left of the box arrowed against the foot of the post before bouncing clear. Four minutes before half-time, Shields did go 2-0 up as a Robert Briggs shot rebounded to Adams, who sent a stunning half-volley into the corner of the net from 25 yards. Less than two minutes later, Adams was on the scoresheet again as he exchanged passes with Gillies and motored into the box before stroking the ball home in composed style. It was the first time he had scored more than one goal in a game in his career and remarkably, he completed a six-minute hat-trick just after half-time. This time Briggs was the provider as he prodded the ball through to him on the inside-left of the box, and a quality low finish from the left-back made it a birthday he will never forget. The four-goal advantage gave Picton and Fenton the ideal opportunity to introduce Foley for his second Shields debut, less than two days after completing his move from Spennymoor Town. He received a rapturous reception as he replaced Cogdon on 55 minutes. Pattison had a shot deflected just past the post before Shields made it five when Adams’ teasing ball in from the left was flicked on by Gillies before being turned in by Pattison at the back post. Pattison collided with the post when scoring but was able to continue, despite initial discomfort. The Mariners had a number of opportunities to make the scoreline even more emphatic. Gillies and Dillon Morse were both denied from close range by Wells, who could only watch as Briggs headed a Gillies corner just over the crossbar. Foley then went within inches of marking his debut with a goal when he was played in on the inside-right of the box and struck an effort which bounced off the post. Against the run of play, Garforth pulled one back when after a ricochet from a corner, the ball hit substitute Curtly Martin-Wyatt and nestled in the net. Shields goalkeeper Liam Connell saved from Devonte Morton soon after but Shields were quickly back in the ascendancy. Dan Wright almost added a sixth when he flicked the ball past his marker before being brilliantly denied by Wells, while Jon Shaw had two opportunities with headers, the first of which was saved by Wells and the second went wide. It was a comfortable afternoon for a rampant Shields as they earned their place in today’s second qualifying round draw. SOUTH SHIELDS: Connell, Baxter, Adams (Lough 71), Shaw (c), Morse, Turnbull, Mouanda (Wright 61), Briggs, Cogdon (Foley 55), Pattison, Gillies. Subs not used: Lister, Hunter, Thompson, McCamley. Goals: Cogdon (34), Adams (41, 43, 47), Pattison (63).